Howdy, and welcome to my review of the Bushnell Hybrid Laser/GPS Rangefinder. This is a fairly unique device, since it merges GPS functions with those of a laser rangefinder. It’s great for golfing, but how useful is it for those hunters out there? Let’s take a look and find out. Apparently, this model used to ship with a handstrap, but not anymore. What’s The Rangefinder’s Maximum Range? According to Bushnell, this device can return an accurate range, to within plus or minus one yard, from five to 1,000 yards. That’s assuming a large, highly reflective target, of course. For deer and other smaller targets, I’ve found it’s only truly useful out to about 175 yards. Beyond that, the 5X magnification isn’t quite powerful enough to get a good bead on your prey. I wish the accuracy was a bit more dead-on, but getting a range to within a yard is halfway decent. How Easy is the Hybrid to Use? Other than the GPS functions, the Hybrid Laser/GPS Rangefinder is fairly simple and easy to use. There’s just a single button, and not many features to wade through. Just point at your intended target, push the button, and you get the range to that object. This unit, like most of the rangefinders I’ve come across recently, only includes multicoated optics as opposed to fully multicoated optics. The device’s 21mm objective lens provides a fair bit of light gathering room, and you’ll enjoy a 367 foot field of view from 1,000 yards. For eyeglass wearers, you’ll love the 21mm eye relief, along with the diopter adjustment. Most rangefinders these days use a lithium CR2 or CR123 battery, but the Hybrid is a different beast. It utilizes an internal rechargeable lithium ion battery. Unfortunately, this does mean you have to charge up the battery before you can use it, so don’t expect to unbox the rangefinder and get straight to work with it. It takes about six to eight hours to get a full charge, and that will only last you about 14 hours of continuous use — even less if you use the GPS function a lot. This is a pretty simple rangefinder, overall, without any sort of slope compensation or ballistic modes. It’s designed for golfers, after all, not hunters. The GPS functionality is almost entirely useless in the hunting fields, since it’s only intended to give you precise distances between different features of golf courses. One nice external feature, though, is the tripod socket. This is very useful if you’re using the rangefinder at a shooting range to confirm distances, since you can just mount it on your tripod and have it at the ready. 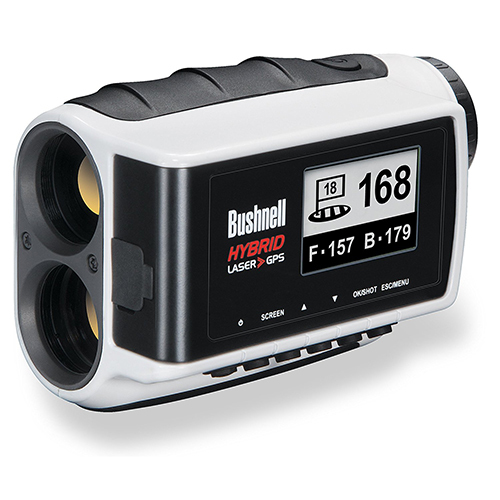 What’s the Light Gathering Capability Like on the Bushnell Hybrid Laser/GPS Rangefinder? Transmittance isn’t really the name of the game here, since this model is meant for golfers. You’ll be able to see your prey even in low-light conditions, but don’t count on being able to read the LCD display with the range to your target. The Bushnell Hybrid Laser/GPS Rangefinder has good optics, and the focus is fast and snappy. Image clarity is quite good, and you’ll find yourself using this rangefinder as much as a 5X monocular as you do a rangefinder. What’s even nicer is how quickly the Hybrid’s Pinseeker mode is able to lock onto just about any target and get you the range to that object. While this particular rangefinder can probably handle a bit of a rain and some splashes, it’s not designed with rough weather in mind. The optics chamber hasn’t been nitrogen-purged and the lenses aren’t O-ring sealed, so don’t expect this model to be fogproof and waterproof. It’s not. The body of the rangefinder is also mostly unprotected plastic, so there isn’t much shock absorption. In short, this is a rangefinder that’s probably best handled with kid gloves. Thanks for reading my review of Bushnell's Hybrid Laser/GPS Rangefinder. This is a great little unit for golfing, but it lacks most of the features that hunters look for. If you are hoping to get the best of both worlds, you won't find that here, but you can use this as a barebones hunting rangefinder with plenty of extra usefulness on the golf course.